There is no doubt about it, we live in the age of red dot sights. These are also known as reflex sights but we will get into the distinctions later. What we are more interested in is what can the best red dot sight do for you. While a red dot sight will not guarantee you better accuracy overall, what it will guarantee is improvement in accuracy when shooting quickly. Your target acquisition will be much quicker and follow-up shots even faster. This is the primary reason why red dot sights are so popular. What is a Red Dot / Reflex Sight? At its core a red dot sight in a (usually) unmagnified optic that has a simple dot reticle that can be either red or green despite the name red dot sight. The dot can vary in size but is usually only 2 to 4 moa so you can get reasonable accuracy from it. The red dot works by using an LED light and a special lens that reflects only red or green light. When the LED shines on it, you get the reticle while still allowing you to see through the sight without issue. This also means that the little LED light will not pass through the lens to be visible on the other side. To get down to the name reflex sight. To do this, we need to understand how these sights work on more than a basic level. There are three types of sights commonly called reflex sights. Prism Sights are the longer tubular sights like an Aimpoint that use two lenses. The light projected onto the reflective lens is completely contained between these two lenses. Reflex Sights are smaller sights that may or may not have a tube and use the simpler projection described above. These are the smaller sights you may see on pistols, shotguns, and some rifles. Holographic Sights are like the EOTECH and work have a more complicated reticle between two layers of glass. When light is shined upwards through the panes of glass, it illuminates the reticle. For the purposes of this article, we will be looking at both the Reflex and Prism sights as red dot sights. The Holo sight is a different animal with slightly different functions and will be excluded here. This is one of the novel things about a red dot that is not so easily understood. Unlike a regular scope which needs perfect eye alignment, a red dot has no parallax to contend with. What this means is that no matter where your eye is, if you can see the red dot and put it on a target, that is where your bullet will go. This simplifies the whole shooting process from needing both a front and rear sight to just needing a single point of alignment to be accurate. This is what increases shooting speed. This makes them great choice for hunting and tactical operations as well as many forms of competition. All you do, in essence, is look through the scope, put your dot on the target, and fire. When you recover and your dot returns to the target, you fire again. No need to worry about sight alignment as you would with iron sights. 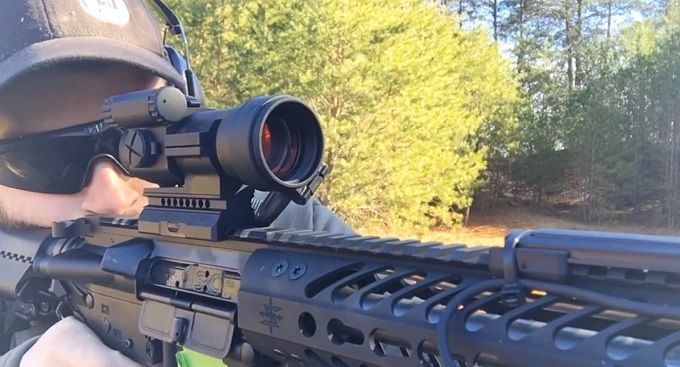 Though a regular rifle scope works much the same way, because the dot is larger and there is little to no magnification through a red dot sight, you will be back on target quicker. You also won’t have to worry about that pesky eye alignment to get things right. If you are just getting your first red dot and you have a weapon like an AR-15, you may not have iron sights which can be a big help with zeroing. This causes many people to have issues zeroing the red dot. But before we get down to how to zero with a red dot without irons, let's look at how to do it with. The simple answer is you lock your rifle down and center your iron sights on your target. Then you turn on your red dot and align the dot with the center of the target. From there, it’s a simple process of walking in your zero till it is right where you want it. Just like with any scope. If you don’t have irons, the best thing to do starting out is to bore sight your red dot. You can buy a bore alignment tool yourself or see if any local sporting goods stores or gun shops have one. Often, they will bore sight a red dot for you for free. Once you have it bore sighted, follow the same steps you would with a regular scope. You are just going to slowly walk your zero in till it is perfectly where you want it. This is probably the biggest decision you will have to make up front. The easy answer is to pick a prism sight for a rifle and a reflex sight for a pistol. But we need to break that down a little to show you why. If for no other reason than both tending to work well on a shotgun. The primary factor in deciding between the two is how far your eye will be from the optic. If you are going to be a long distance away, like with a pistol, not having to look through a tube will be far easier on you. This makes a reflex sight a much better option. If you are going to be close to the optic, like with a rifle, looking through a tube won’t be as difficult so you can use whichever you like or decide based on another factor. That factor is durability in most cases. A prism sight is far more durable than a reflex sight in every case. The self-contained tube is far better for dealing with getting bumped around than the exposed lenses of a reflex sight. While most red dot sights have great battery life to begin with, there are some that have staggering battery life. At some point, your life may depend on your optic working or at least getting a clean shot at a deer. If so, you need to trust that your optic will work the moment you turn it on without fail. Most lower end red dots, especially reflex sights, will have battery life in the hundreds of hours using a watch battery. A more common number is to see hours in the thousands. Some prism sights use a larger lithium battery and can run for thousands of hours. There are even some, like the Aimpoint PRO, that are always on and will run constantly for up to 3 years. Another option are the rare optics that use tritium instead of batteries. These last essentially forever but cost quite a bit more. Red light works great during the day if you have a high enough intensity. With an intense red light in the dark, it will wash out everything else. You will need some method of regulating that light intensity. You may get some optics that have as few as 4 settings while some have more than 10. Green light at night has a less pronounced effect on your night vision and will not wash out as badly. However, it will be much harder to see during the day. It can be a great option to have if you want it but it should only be an option with red being the primary color of the sight. If you are wanting a red dot for Glock 19 or similar pistols that you occasionally use at the range, most any will reflex sight will work. If you want it for a hunting weapon or something that may be out in the rough elements or banged around, you want something more rugged. Always take the time to research factors like impact resistance, water resistance, and the materials the sight is constructed from. At a minimum, it should be waterproof and made of aluminum or steel. Plastic sights are pointless on any weapon you intend to use hard. There are dozens of companies making red dot sights today and all have various features and levels of quality. While most other than the very cheapest will do well, there are a few brands you can always be on the lookout for. Primarily brands like Trijicon and Aimpoint are at the top of their game. You could add Leupold in with these top of the line brands as well though they are about half a step lower. In the second tier, you have your normal optics companies like Bushnell, Nikon, and even Sig. You also have the ever-popular Vortex in this tier though they make several models and some are better than others. In the middle of the pack, you have the remaining Vortex optics as well as Primary Arms and a few others. Some companies specialize in making crap and touting it as good quality. While there are too many brands to name if a red dot is far cheaper than other companies it is probably not worth it. Just because it's not named above doesn’t mean its crap. The list isn’t exhaustive by any means. Because there are two different styles of red dots, it's probably best to look at a few of each. And with that, let’s look at some of these red dots and see what comes out on top. While there is a cost associated with the ACOG that can hard to swallow, there is not optic that has been more used and proven in combat. This speaks of its quality, accuracy, and durability in a way that no other claim can ever hope to. Simply put, for what it is, this is the best prism scope red dot on the planet. The version is the USMC model that was designed around the M16 platform making it a perfect match for your AR15. It has a small amount of magnification, 4x which helps to extend the range of the 5.56 ammunition to about its maximum potential. Unfortunately, this also means it also has eye relief which is about 1.5 inches. However, it can be fired with both eyes open for CQB uses. The construction is a very hard and expensive aluminum alloy that is tougher than used by other companies. It is water and fog proof and even though it was intended for smaller calibers, it is well capable of holding up to magnum calibers without issue. The reticle was designed to work for .223, .308 and even for 300 blackout. A little adjustment will put you on target without issue. The simple Chevron reticle is a bit different than normally seen on a prism scope but nothing about the ACOG is normal. Why should it be when it can be an exceptional example that most companies can only emulate? When you are looking at a more traditional prism red dot, Aimpoint are the kings. While we could have gone with the COMP series among many others, the PRO is about the best for the money of all of Aimpoint optics. It was designed for police duty rifles and has served that function for a number of years without fail. This is absolutely the best red dot under $500 that you can get. It has no magnification and uses a 2 MOA red dot for the reticle. It is uncannily fast and very accurate. You can use it both eyes open for perfect situational awareness. It is even night vision compatible. You will score more hits faster with an Aimpoint than you have with any other optic you have ever used. It will never let you down and never stop working short of a devastating accident. It is waterproof down to 150 feet and made of a hard anodized aluminum. It comes ready to mount and do service and even has a removable spacer allowing it to function for shotgun or rifle. The battery life is the truly exceptional aspect of the PRO. It is always on with no off switch but it does have an indicator telling you when your battery is low. You won’t see this often as the PRO can run for up to 3 years on a single battery. If you want a no-compromise optic, the Aimpoint PRO is exactly what you need. It is immediately noticeable that the Strikefire series of optics very much resembles the Aimpoint. While you can’t top perfection, you can do your best to emulate it. And that is what Vortex did but at less than half the price. That is under $250 for a high-quality optic. This prism scope can be fired with both eyes open and uses the same red dot for a reticle. Well, it can use the red dot or green if you prefer when shooting in low light. Both have varying levels of brightness and come in at a larger 4 MOA which is a little worse for accuracy but much better for speed. Though this optic is budget priced, it is not built that way. With a hard coat aluminum that is sealed and purged for the best possible waterproofing, it was made to use. This has become a common choice for deer hunting in the denser woods and even hog hunting on occasion. For the price, you could even pick one up for Ruger 10/22 or other small bore rifles for squirrel hunting. It is perfectly at home in the woods. While it doesn’t stack up to the Aimpoint’s battery life, it does have over 6000 hours of constant on time which is about 8 months if you are doing the math. With the flip of a switch, this optic should be ready for service for years at a time. It is recommended you change the battery once a year and that will ensure it is never dead. It even turns itself off if you forget. Rounding out the bottom of our prism scope red dots is the Bushnell TRS-25. It would be hard to argue that any scope company has been as successful in the civilian market than Bushnell. They are on every type of gun for about every purpose you could think of. There foray into red dots has been just as successful with budget offerings that are very good quality. This is about the lightest prism scope on the market at only 6 ounces and perfect for just about any platform from .22 too high powered deer rifles. For low light, it can be adjusted to be very faint and with 11 brightness settings, it can get intense enough to easily see in full sunlight. The dot is 2 moa which is a perfect blend for accuracy and speed. This is a quick sight that is very easy to sight through with its shorter length. All Bushnell scope use an aircraft aluminum tube that is hard coat anodized for increased durability. They are sealed to keep out water and fog, making them a great choice for hunters and popular on shotguns for turkey hunting and rarely for duck hunting. Hunting isn’t all this can do. It is designed to work on the AR-15 but can accept risers and other mounts making appropriate for AK 47 rifles or just about anything else. Battery life is shorter but still over 1000 hours of use. It isn’t likely that you will run this down any time soon and even less likely that you will ever need to use the full warranty to replace it. Like last time we are going to kick this off with a Trijicon. This is really for two reasons, first, it is the best reflex sight out there and second because it can be mounted along with an ACOG to provide you an even more versatile platform. This will turn your rifle into a weapon capable at hitting quickly up close while nailing targets at range. While these used to cost a fortune, they are now well under $1000 which is where they started. They are actually under half that amount. And for that, you get a red dot with a 3 MOA dot that can be used day or night and even with night vision. And they will run for over 4 years of continuous use with a single battery. Construction wise, they are the same high-quality aluminum as the ACOG. They can be purchased alone or with a variety of mounts to suit any need. Even with the ACOG mount, they are still under $600. When you need the best, Trijicon makes the best. The military has known that for decades. We also need to revisit Vortex if we are looking for the best reflex sights. Their Viper series is among the best selling on the market and works on so many platforms that they are popping up more and more. You even find these on handguns from time to time. They serve any purpose well and they should. Vortex isn’t in the habit of making bad products. No matter where you look, the viper should come in under $400 and can be under $300 if you shop around. Like all their scopes you get a lot for that money including nearly indestructible quality. They are completely water and shockproof while being ultra-clear and crisp for perfect viewing. The dot is 6 MOA which seems quite large but when used for pistol or shotgun, this is a huge asset as it remains visible at a distance. For a rifle, it still works perfectly and will allow you to shoot faster with faster follow-ups than smaller dots. All around, this is a great choice for a red dot optic and one that fits almost any budget. You may recognize the name of TRU-GLO from their famous night sights that were so good they were adopted as a factory option by many handgun manufacturers. While they still make those sights, they have branched out to the reflex sight world with a tiny micro-dot sight that is both long gun and handgun friendly. Starting off, the TRU-TEC is fully CNC machined from aircraft-aluminum to make it tough, precise, and TINY! This little red dot weighs just over a single ounce while still being completely shockproof. It may look small but stick in on a 12ga and let her rip. This sight doesn’t care at all and will function flawlessly through it all. On top of it all, it is also sealed to be waterproof. If it has any problems at all its that it can be a little too small. Most people don’t feel it will work well with their rifle. This is incorrect but if you want a bigger sight, go for it. If you want something tiny that will be out of the way and not cause any issues, the TRU-GLO is a great choice. Sightmark is another one of those recognizable names in the world of weapon sights and they too have strayed into the world of the reflex sight. They make several different versions of this sight but you are better off sticking with the Ultra Shot Pro. For the price, this is easily the best choice of all of Sightmark’s red dots. The one major weakness of this sight is that it is cast aluminum which is weaker than the forged used by most companies. It is much cheaper and for rifles such as the AR-15, it shouldn’t be an issue. Magnum calibers could cause some stress though Sightmark does guarantee it as being shockproof. It is also weatherproof but not waterproof. The main reason to stick with the PRO model is battery life which goes up from less than 200 hours to almost a thousand. While that may be much lower than other companies, it should be far more than you ever need. And that is the niche this sight falls in to. For those on a tight budget, this is a sight that fits and performs very well. There are hundreds of brands of red dots and thousands of models made over the last 40 years since they were introduced. The modern market is full of them and there are far more good optics than are listed here. We wanted to narrow it to the best with a few budget options thrown in. While many will work well, none will outperform those we found to be the best red dot sight.